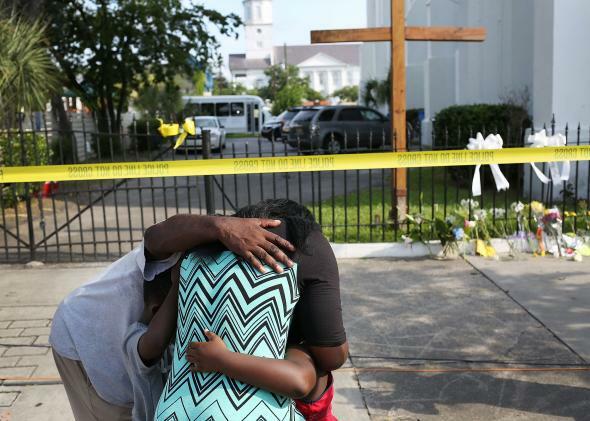 People mourn together in front of the Emanuel African Methodist Episcopal Church on June 19, 2015. That pretty much sums of the tenor of the international media reaction to the massacre in Charleston on Wednesday, which has focused on the endurance of racial tension in America, despite the election of an African-American president. “The first black president in U.S. history has been powerless to change a country that, despite many successes, remains profoundly marked by racism,” editorialized France’s Le Monde. The paper also criticized the Republican Party’s resistance to gun control, noting with incredulity that South Carolina Senator Lindsey Graham is himself a proud gun owner. “Part of the political class bears a heavy responsibility for these mass murders,” the editorial argues. As with recent events in Ferguson, state-affiliated media in countries that are normally on the receiving end of criticism from the United States over their human rights records and treatment of ethnic minorities took the opportunity to point out that America is a long way from perfect. “Analysts said that unless U.S. President Barack Obama’s government really reflects on his country’s deep-rooted issues like racial discrimination and social inequality and takes concrete actions on gun control, such tragedy will hardly be prevented from happening again,” writes the Chinese news wire Xinhua. Not surprisingly, the case has drawn interest in Zimbabwe and South Africa. In the widely-circulated Facebook photo of suspect Dylann Roof, he is shown wearing patches featuring the flags of Rhodesia—the white-dominated state that preceded modern Zimbabwe—and apartheid South Africa. As my colleague Jeremy Stahl noted yesterday, these flags have been appropriated by white supremacists in the United States.